I found out last night that my friend's band won the YouTube Underground music contest for best song. So congrats to Greenland. Was it the question about the area of the right triangle that tripped you up? I'm pretty sure that was the one I missed when I did it...afterwards I realized how easy it was (a right triangle is one half of a rectangle with sides the length of the sides of the triangle - length times width, divided by two. Couldn't think it through fast enough. I scored the same, and I suspect it was the dangling modifier that got me. I scored the same, but I'm not sure what tripped me up. Do they give the answers?? HA! I scored a 97%. Not that I'm overly competitive or anything, but for some reason I had to rush right back here and let the world know! I'm sure the Killeen Independent School District would be proud. Today I had dinner (split pea soup) simmering in the crockpot by 7:15 and managed to make banana-cranberry bran muffins before lunch time. We also did school and I had my 6-week post partum check up. I seem to be getting things done and everything is clicking. What I want to know is -- why can't I manage this level of efficiency at least once a week? why can't I once a month??? Did you know that you can, in fact, cram a 26 pound child into a size 1 diaper? I wouldn't recommend it as a general practice though. The cries of, "Mommy, my diaper is too tight!" get kind of annoying after a while. I could have gotten a better fit if I'd had some duct tape in my purse. I already carry a pocket knife and a tape measure, but clearly my Mcgyvering skills would be improved by the addition of duct tape. Do they make purse-sized rolls? New Potty Training Tactic! Busy mom discovers that squishing a 2 year old into a size one diaper encourages them to potty train quickly. Oh no!! Sounds like time for a Target run! Oh, I had plenty of size five diapers at home, but some how none of them were in my purse at the library. 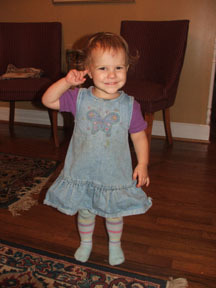 My granddaughter weighs 25 lbs and she's 13 mos....a long way from potty training. I need to procure permission from Jordana--I am wrting a book and you're in it--with your permission. For a duct tape substitute, you could choose between electrical tape (not as strong but easier to tear with your teeth) or a narrow roll of nylon fiber-reinforced strapping tape (that would hold most any "deposited" load!). Don't know if you could remember, but it would be interesting to see the progression of your purse size as you have added kidlets to the mix. >Do they make purse-sized rolls? Actually, they do; it's in the auto repair or sporting goods sections at your favorite megastore. It comes wrapped around a flat piece of cardboard, not a round core, so it takes up very little space. Considering the number of times Jay has come home in Isaac's diaper, I can believe this. You are AUNT AGATHA!You are traditional, dignified, and in full control of your faculties. You know exactly how things should be done, and you do not suffer fools gladly. I long with all my heart for you to biff off--and after sneaking into the kitchen for a quick restorative, I may quakingly ask you to do so. Taken from the Llama Boys. The house looks charming, by the way, and I can already imagine how it will begin to look after you all have been mano a mano with it for a while. So is it true that you eat broken bottles and howl at the moon? Our termite inspection was this afternoon and didn't turn up anything active and only a small, old bit of damage. So that's that. I guess we really are buying the money pit on the other side of town. I love the character of old houses. I just don't like repairing them. Ours is almost 60 years old, but it's got its own issues. 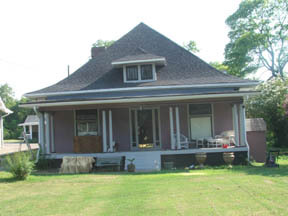 Hey, I think your present house is dishy, but it looks like you're advancing to a bigger front porch with this one. Looks like you'll be spending lots of time outside, eh?!! Lots of, um, "gardening opportunities." Janis, you don't know how much I want to cry when I think of all the time and money I've spent on the garden here. Since we're going to have some overlap time in home ownership, some plants are going to be moving with me. I think I do know and I'd cry, too. Congrats! I think the purple house is cute! Congratulations! We live in a old moneypit, too. Martha Stewart has her 2006 Thanksgiving menu up. Although nothing looks bad, the menu is not one that inspires me to change a thing in the menu I'm planning. What's on the menu over here? My husband keeps requesting that we trade the turkey for a rib roast, but I like turkey and the bird is staying. As for side dishes, we'll be making cornbread dressing, spinach gratin, possibly sauteed brussel sprouts (I love them and don't care if I'm the only one who will touch them), mashed potatoes, cranberry-pear-ginger sauce, maple-bourbon pumpkin pie and perhaps apple-cranberry cobbler. There may be something else that isn't coming to mind right now, but we'll see. That already sounds like plenty. We are having Turkey Day with the inlaws. So that means we will probably have turkey. There will probably be macaroni and cheese. I am bringing mashed turnip with crispy shallots a la Barefoot Contessa. There will be salmon or shrimp (bil does not eat meat) and I am not sure what all else will be there. We will have pumpkin pie and pecan pie for dessert. My mil always brings them. They are definitely a store bought crust. I'm not sure how she makes her filling, but they're nothing like the made-from-scratch pies I grew up with. I always have to grin and bear dessert on Turkey Day with the inlaws. I don't have a clue for my menu. Just Lyman and Michael and I, and Michael has an invitation to a friend's house. Cornbread mini muffins (done yesterday) turkey on the grill, mashed & sweet spuds, cranberry sauce, and I think I'm going to take a stab at stuffing with pieces of sausage tossed in. Mom is also bringing chestnut stuffing & apple pie, and maybe a chocolate cake since it's my brother's birthday in a few days. That all sounds delicious! We're having turkey, dressing, mashed potatoes, candied yams, brussel sprouts with chestnuts, glazed carrots, creamed onions, cranberry relish, pumpkin pie, pecan pie, and -- I think I'd better go start letting out my pants right now. We're eating with my in-laws as well, and I think it's going to be the usual--huge piles of turkey and ham and cornbread dressing and potatoes and beans and peas and giblet gravy (which I think tastes like the turkey guts stewed in flour and grease) and mashed potatoes and carrots and rolls and cornbread and potatoes and a big ugly cylinder of cranberry sauce and pie and things of that nature. I think I'll have a slice of turkey and some green beans. Miss Kathie and I did the grocery shopping last night. We're having a 22+ lb turkey, turnips and squash (can you tell Kathie's a Yankee? ), potatoes, rolls. We haven't gone completely native yet here in Baltimore, so no sauerkraut. Sister-in-law is bringing a green veggie, and mom is bringing pies (the whipped cream goes on the pumpkin pie, Terry). The pies will have real crusts, made with lard. I don't have any interest in having a different main course than turkey, although for Christmas would rather have beef roast or leg of lamb. We don't expect youngest son and his wife, since they'll be sticking close to the hospital, since she's due any day now. I'm not trying to turn this into a website of all quizzes all the time, but so much has been occupying my mind this week that I haven't been up for much else. We've been busy with homeschooling, of course, but on top of that it looks like we will be buying another house after all. Without going into a lot of details, we have a contract on a big old house on the other side of town. It will need a lot of work, including several things that must be done before I will feel comfortable moving in (not even counting the kitchen which, at present is only a bunch of unfinished cabinets without electricity, plumbing or any appliances). It fell in our price range and is a good size for our family while still being close to town and satisfactorily old, and so we'll just have to take on the work and learn to tolerate the problems. I love my current house and location, so the thought of moving makes me sad. We never really planned to move from this house, but although I think we could have done more to make our current house work better for us, I think ultimately it would always feel cramped and our children are just going to grow larger. The new house is also really beautiful and despite all the drawbacks, I really am excited to think of living there, fixing the place up and seeing my things decorating the place. Assuming, of course, that the termite inspection doesn't tell us horrible things, we'll be closing in about a month and moving in as soon as we can have some of the necessary things, like rewiring, completed. Big move. I hope the new house works out for you. It's difficult to be in the "waiting to buy a house but not actually having the deal done until everything is signed" zone, especially where them wood-chewin' critters are involved. It will cost a few $$ extra, but have them fish through CAT-6 cable with the house rewiring. While wireless is nice, it cannot come close to a hard-wire network for speed and security. In a few years the technology for "video over the net" will be well established and available for the masses. It could also come in handy if there are play areas you want to monitor (yes, spying on the kidlets) while you are tending to other important matters, like blogging. I shall be thinking warm and hopeful thoughts for you in all this, most especially with your holding on to a peaceful outlook in the middle of what is inevitably a chaotic time of activity and emotions. How wonderful! Old houses are the best, even when much work is involved. I will be praying for a peaceful, worry-free transition for all of you! Think of all the homeschool lessons you can provide while renovating. Measuring, color and design, reading how-to books, shopping, etc. Is this the same house (minus kitchen) that you were considering earlier? 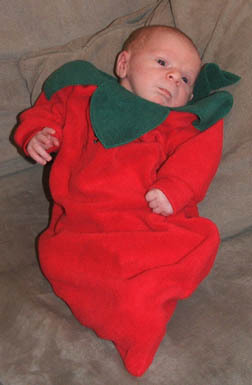 Nothing like a little move thrown into the Christmas season, plus a new baby to make life exciting! I hope the house works out for you! Congratulations! If you're like me, you'll at least gain back your realtor.com time. I've managed to curtail mine considerably, but the house we had a contract on is still on the market, and for $30K less than our contract was for. If we knew we'd have a source of incomeclose to Mebane, I might be doing some serious research into construction loans. As it is, I'm just bummed. 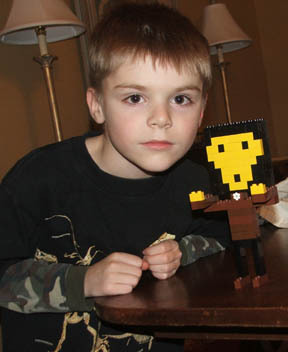 I think you definitely need to start a houseblog ;) The Boy can do it as a homeschool project! Me too! But my breakdown was different. Oh, um, I REALLY shouldn't take this test, should I? Probably not a quiz for those of the Jewish faith, Dan. I figured, but I suspect I'm one of the few orthodox Jews who's ever heard of Arianism, Monophysitism, and Albigensianism. Not that I could define the difference to anyone on a bet, but at least I can vaguely identify the time period for each. Stupid quizzes. This one calls me a book snob. I read what I can find in the local library. They're trying to call me a Northeastern Book Snob, Jordana, and that hurts my feelings. Clearly these quizzes are not 100% accurate, Janis. I too am a book snob, so don't take it personally. The question about the books made into movies, for example, was kind of pointless. I answered that my favorite would never be made into a movie because a) I like too many books to choose one, and b) the history I read is generally not movie fodder. I certainly do not read simply to impress others, but that's what the results say. As Terry usually says about everything, YMMV when these quizzes come up. I found that if I lost track of the number of books I was reading at one time, and would drag a pack of books around on vacation rather than buy them on site, then I would become a dedicated reader. 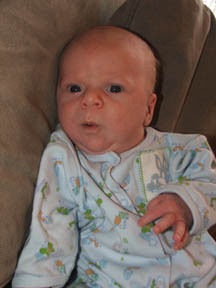 I can't believe it, but it has already been a whole month since the wee one arrived. As his father always likes to say, "Babies eat, sleep and excrete." He likes to do all three with great frequency. His siblings are fond of him. My main job is keeping them from squishing the baby with too much love. I can't believe that it won't be long before he's participating in the chaos and chasing his brother and sisters around, but that day will come all too soon. I know from experience. I have to start working on ways to keep my little one little. These months pass too rapidly. he is beautiful. I'd want to squish him with hugs too. I can't believe he's already a month old--how handsome! Ditto to the above. He's a cutie. I love those little rosebud lips. And a month? How can it be? "I have to start working on ways to keep my little one little." I don't think anybody has found a way yet. The next best thing is to thank God each day as you have the privilege of loving that baby, as well as the rest of your babies. I hope the sleep schedule is getting a little better for you. When do you plan to renew the homeschooling? Or are you already holding sessions? Still looks like those other Adams kids to me. Jordana, it's been awhile since I visited your blog. Congrats on your new son! He's a cutey! oh my goodness, he is soooooooooooooooooooooo cute.. we are talking extream cuteness.. what a doll. BUT WOW a month already.. I want to keep them all little also.. if you figure it out let me know. Don't you just love having 2 of each now? My two year old just came running in and said, "Behold! I have tights." That is so funny. "Behold" is a very underused word. Sounds like that classical education you're dishing out to the older ones is paying off with this little treasure! Hey, love how her hair flips up on the sides. She's a doll! And lo, they are cute tights indeed. Oh what a sweetie...and I remember her when! If Jay used that word, I would have not a clue. Not a clue! Miss Rebecca loves your daughter's outfit. She pointed to the picture and said "She has a pretty dress." I signed right up for NoBloShoeMo when Chris sent me an invitation. Fortunately the rules didn't actually insist that one post thirty days of shoes, because I can't seem to get around to getting photos off my camera every day, let alone taking photos of my shoes every day. But here's a shot of the shoes I wear on a lot of days. Comfy, if not so very pretty. 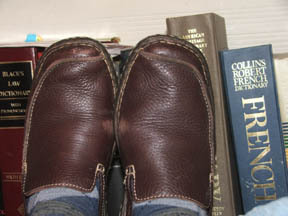 Those do look comfy, which is my main standard for judging shoes. Honestly, I look at the folks wearing Manolos and wonder about their quality of life. Appearance is, after all, only bunion deep. I think this is a great shot, BTW: funny and thought provocative. It seemed like there should be a clever response to it, but it'll have to be one of your other Faithful Readers who comes up with it. Is it the dictionaries in the background that make you laugh, Patricia? I admit to never using the Black's Law and only touching the French dictionary in extreme circumstances. The barely visible grey American Heritage was my mom's in college and I use that one all the time, although I suppose I should begin to wonder when a dictionary becomes out-dated. My feet are conveniently covering up my husband's college Webster's dictionary, which I claim to think is inferior to my American Heritage and therefore I won't use his. The binding, at least, is superior on my much older dictionary. And yes, bunions -- I am cursed with the worst of my parents' toes. I have both slightly webbed toes and bunions. I never wear pointy-toed shoes, although I secretly think they look kind of pretty. It's something like the juxtaposition of Black's and the French -- sort of a "Magna Carta to Napoleonic Code" thing going on, I guess. Last year The Boy was some what obsessed with Legos. 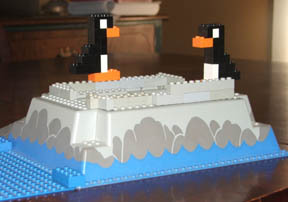 Over the summer, he forgot Legos in favor of dinosaurs and my bare feet cried out in gladness. Unfortunately, as autumn arrived, the dinosaurs fell out of favor and Legos have returned. The bad news is that the upstairs area where he plays is a disaster area and I constantly curse the creators of Legos (I suppose I should learn to curse in Danish). The good news is that I always know where to find The Boy. The other good news is that he makes some interesting things. 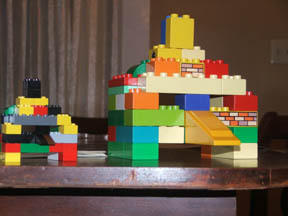 Yes, it is all about Legos here and I haven't even shown you his Lego nativity scene, the Lego houses, Lego Empire State Building or some of the other things he has made lately. It would seem the last image is ripe for a homeschooling lesson on the Byzantine iconoclasm efforts of the 8th-9th centuries. You may get enough off Wikipedia there, or I would recommend for your own background reading John Julius Norwich's three volume set on Byzantine history. I suspect you'd need the first two volumes to cover it, but check with your local library. We're not really due to start that study until next year, right now we're working our way to the the fall of Rome by the end of this year. Still, as one might have guessed, he seems to have developed an interest in such things. One suspects that those who actually use icons would probably not approve of the Lego variety. 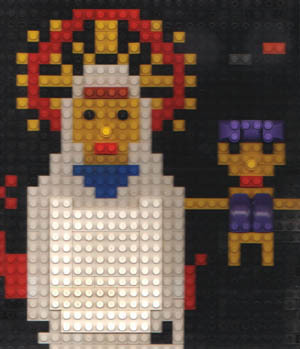 I assume you are aware of the Lego Church? It is really quite amazing and disturbing, both at the same time. A Church of Christ with a raised pulpit, an organ and a crucifix? Even in Legoland that doesn't make any sense! Pretty amazing! Making those figural creations is harder than it looks. I haven't actually gotten to vote yet. First I forgot to take advantage of early voting. And while I've gone out and driven past my polling station twice this morning, the lines were long enough that I decided to wait until I didn't have to vote with four children in tow. I'll get there eventually. In the meantime, I thought I share this little bit of political profiling (not to mention profiling of other sorts) that was left on all the houses in our neighborhood the other day. The small text reads, "So much is riding on your vote. Money for classrooms instead of war. Retirement security for our elderly. Good jobs to keep our young people off the streets and out of trouble." Take a ride ... as the Dems hike the minimum wage, resulting in less buying power (so much for the dollar menu at McDonald's and Wendy's) as well as less jobs for getting those "yutes" off of the streets. It's trouble alright. Retirement security for the elderly = higher taxes. We went to a picnic with other homeschoolers in the area (the area being defined in the broad sense since most of these people live at least 30 minutes from us) on Saturday afternoon. I enjoyed meeting some new people and chatting with others doing what we are doing, but my favorite moment was when I heard my son ask the kid he was digging in the sand with if he had "heard of the heretic pharaoh Amenhotep." And the kid said, "Of course." Both these boys are six. Oooh ... I am impressed. I took that test the other day, and it reported that I have a Northeastern accent. I do believe something is dead wrong with it. It's probably correct for me. I was born in California. Lived there for 5 years and Arizona for another 6 or so. My parents are both Westerners, so my particular accent is almost certainly Western. well, you certainly were never a drawler. Today is not just the day after Halloween or All Saint's Day. Here it is most commonly remembered as The Younger Girl's birthday. She's two. Which means she's got a strong will, sweet smiles and a personality that makes you fall in love. She never misses anything. She sees all and she says all. She talks almost constantly. Much of what she says is sweet, but also repetative and as I've mentioned before, she has learned many things from her older siblings that they didn't know at the tender age of two. She doesn't seem to understand that at only two she shouldn't think she can do everything a six year old and four year old can do. Not that that stops her. She's in the fray and part of everything that goes on around here. The Younger Girl sings and loves music. Every afternoon before her nap, she wants to hear "My Bonny Lies Over the Ocean" and "You Are My Sunshine." She wants a repeat of the latter at bedtime. I love it when she sings to me in return and it surprises me how much of the lyrics and tunes she remembers from songs we sing around the house. Just a little less than two years ago, I was surprised and upset by the appearance of a hemangioma in the middle of her forehead. I had never seen such a thing before and all I wanted was for someone to get that thing off of my little girl. At the same time, I did not want to subject her to cosmetic surgery just for my own vanity. The birthmark is still there, but just as the doctors told us, it is shrinking and fading away. If she ever grows some hair, the birthmark really will be almost invisible under bangs. I'm glad it is disappearing, but I'm certain I also needed the lesson in learning to worry less about appearance and remember just how wonderful and beautiful she has always been even when the red mark was at its largest. Happy birthday, you adorable little two year old! Two years already? She is adorable! Happy Birthday, Smiley! Does she like to play on the sit and spin, or is this picture posed? Very cute costumes! 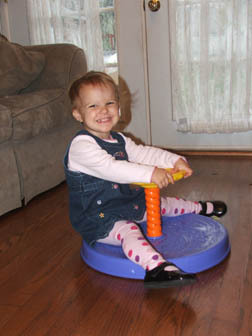 The Sit and Spin has been very popular with all three children able to sit up and spin. In fact, I've had to give them timed turns, because they all want to be on it at the same time. Timeless toy. It was that much fun in the 1970s too. Do they have to wait a half hour after meals before sit-n-spin? That smile is a real heart-stealer, where she looks like she says "CHEE!" for each photo. Love the "gimme candy" approach that she used for Halloween. That's better than "trick or treat", because who would want a trick? I'm late as usual, but tell her Happy Birfdy for me! What a cutie! Happy Birthday from us! Happy B-day to her ;-) and Happy Mother's Day to you, dear lady. Although earlier in the day, the forecast had called for evening thunderstorms, the weather turned out to be cool and only slightly overcast. We handed out a candy to the early birds and then turned out the lights and went out on our own candy-seeking adventure. 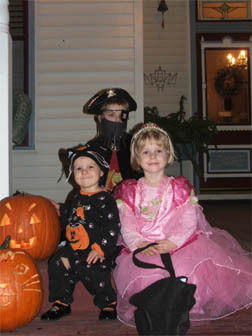 Yes, as you can see, all of the children were in costume. The Oldest wins most creative costume -- not because of his homemade beard, but because he was not your average pirate, but Mad Dog Morgan, pirate captain in The Voyage of the Arctic Tern, an epic poem that Justin is reading to the kidlets for bedtime. The younger girl was too young to understand trick-or-treating last year, but this year she thought it was the best thing she'd ever heard of. We did have to reign her in a bit as she started walking up to people's houses, sticking out her hand and saying, "Give me candy!" 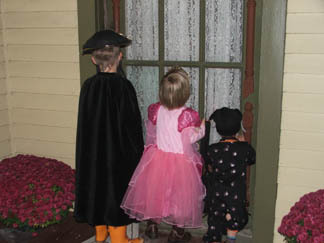 Halloween always makes me a bit grumbly, but I do like getting out and seeing the neighbors and the children had a blast. 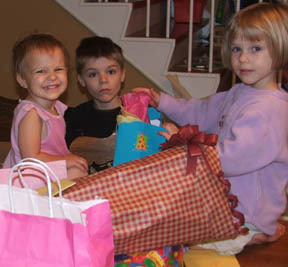 Naturally after they were in bed, we proceeded with annual raiding of the candy bags "Mmmm, dark chocolate!" and other candy reduction measures were taken that should result in there being better candy at my husband's office for a month or two. I skim off the top for the Christmas stockings! Oh so cute!! And dark chocolate... YUM!